Soon after the Environmental Protection Agency was established in 1970, it hired freelance photographers to document environmental problems and the work that was being done to address them. The project, dubbed Documerica, generated tens of thousands of photos — now available online — that give us a glimpse of the kind of contamination that the America of half a century ago considered acceptable. Many of the photographs were taken in Southern California, home to some of the nation’s worst pollution, notorious for its thick clouds of smog and overflowing landfills. One especially moving image shows a cleaned-up albatross being gently released at the shore by U.S. Fish and Wildlife Service personnel following an oil spill. But where are all the people? Few of Documerica’s photographs show the faces of those whose lives were most upended by pollution: usually low-income communities, often people of color, living next to the freeways, factories, mines and dumps. If all goes as planned, the new Bureau of Environmental Justice, an agency within the California Department of Justice, will be the first serious effort to acknowledge and protect those who have historically bore the brunt of pollution. It’s the brainchild of California Attorney General Xavier Becerra, the first Latino to hold that office in the state, who was sworn in just seven days after President Donald Trump’s inauguration. Becerra is part of a wave of second-generation immigrant Latino political leaders in California who came of age in the ’60s, alongside labor, environmental and social justice movements. Becerra has filed almost 30 lawsuits against the Trump administration in the past year, many of them involving clean air and water rights. So far, he has yet to lose an environmental lawsuit. Under his leadership, the Bureau of Environmental Justice will have a staff dedicated to overseeing, investigating and enforcing environmental laws, especially in cases of persistent contamination. That’s the old and tired jobs-versus-the-environment argument, the lie that’s been used to excuse industry-friendly policies that often hit people of color the hardest. The new Bureau of Environmental Justice is betting on the fact that a strong economy and a clean environment are not mutually exclusive, despite what industry says. 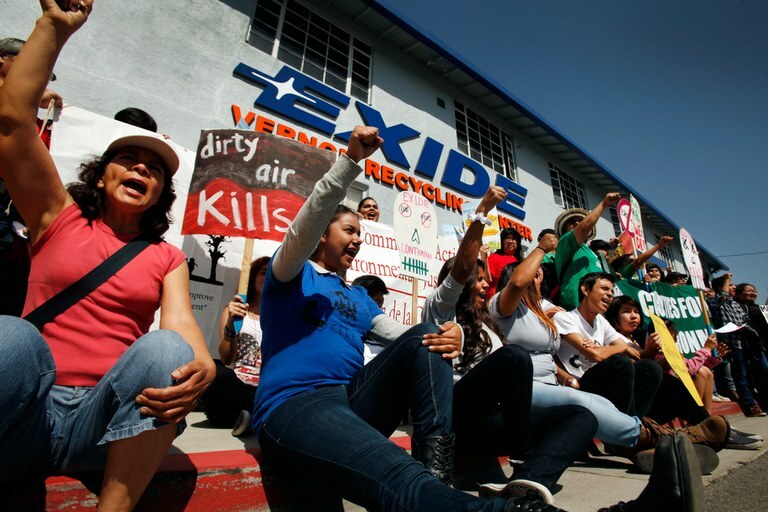 Citizens join a 2014 rally with Communities for a Better Environment and California Environmental Justice Alliance in front of a battery recycling plant in Vernon, California. The rally called for statewide action to address the levels of lead and arsenic affecting east Los Angeles neighborhoods around the plant. One of those campaigns centered on the National Beef slaughterhouse in Brawley, California, an agricultural community that’s 82 percent Latino, with a median household income of $37,000 a year. The company was known to generate about 1.6 million gallons of wastewater per day, willfully discharging excessive amounts of ammonia, bacteria and other pollutants into local waterways. The state fines started coming in 2006, including a $3.7 million one for water pollution violations. So, in 2014, the slaughterhouse announced that, due to financial reasons exacerbated by those fines, it would be shutting down operations and laying off 1,300 workers. The company never did clean up its mess. Someday soon, he suspects, we will realize that the list of open environmental injustice cases in California has become as long as it was back in the ’70s, at the height of the Documerica project. The EPA, as it currently exists, seems unlikely to take action. Then it really will be up to California and its new agency.